凯雷斯特拉兹（Caelestrasz） (Calen in his night elf guise) was an ancient red dragon and a child of Alexstrasza. He waits in the Temple of Ahn'Qiraj in the form of a night elf, taken captive by the Qiraji alongside Arygos and Merithra. 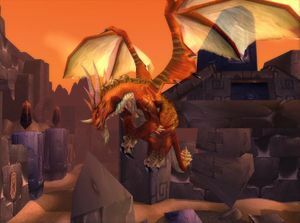 He later reappears in Cataclysm helping Alexstrasza in her battle against Deathwing. 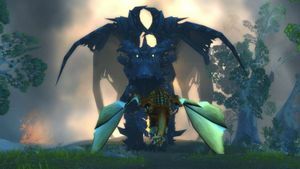 When the Qiraji started their first invasion of Kalimdor, Anachronos agreed to enlist the bronze dragonflight against the marauding Qiraji with the night elves. Even with the might of the dragons backing them, however, the sheer numbers of the Qiraji and silithid proved overwhelming. And so Anachronos called upon the progeny of the remaining flights, including Caelestrasz of the red dragonflight. The Dragons fly into battle. Caelestrasz, along with Arygos and Merithra, pushed the Qiraji back into Ahn'Qiraj to allow Anachronos, Fandral Staghelm, and the night elves to create a magical barrier to hold in the Qiraji. The three dragons and their companions flew headlong into the Qiraji legions, into the city where they hoped their sacrifice would not be in vain. 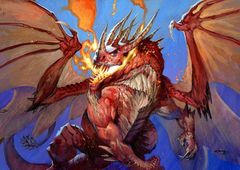 Though the magical barrier was created, the three dragons were lost within the walls, where they still remain today, in humanoid form, as prisoners of the Old God C'thun. Caelestrasz, in his night elf guise Calen, reappears in Cataclysm outside Grim Batol along with Lirastrasza and Alexstrasza. In Twilight Highlands Alexstraza confronts Deathwing. After several minutes of battle, Deathwing and Alexstrasza fall from the top of the mountain towards the ground, clutched tight in each others' claws, determined to destroy each other. Calen and the player fly in persuit. Alexstrasza, exhausted and gravely injured, is reduced to mortal form and lays on the ground halfway down the mountain. Deathwing continues to fall beyond the crest ouf the mountain, out of sight. Calen (who likewise takes elven form), the player and the player's drake race to the dragon queen's side. Like a phantom, Deathwing rises up, his gigantic form casting a shadow over the land. Deathwing sets the ground at his feet aflame, glowering over the group. Calen runs back to put himself between his queen and Deathwing. You throw Alexstrasza's body over your mounts back amd take her to safety. Calen takes his true form again, and your drake launches you in the air, flying away with all haste despite Alexstrasza's protests. Calen, while gigantic by mortal standards, is completely dwarfed by the Black Aspect. Realizing he can't stand a chance against Deathwing, he shoots a fireball or two at him, darting back and forth to distract him and keep him from pursuing you. Calen also appears in his night elf guise during the Sinestra encounter, the heroic only final boss of The Bastion of Twilight. In this fight, he does battle with Sinestra, only to lose his life in the process. Upon dying, he grants the raid a 3 minute buff, granting 100% additional haste. Do not forget the sacrifices we made on this day, night elf. We have all suffered immensely at the hands of these beasts. Alexstrasza grant me the resolve to drive our enemies back! Even if you somehow manage to free us without defeating C'Thun, we would focus all our powers to see the beast banished back to the hell from whence it came - AT ANY COST. Our freedom would have meant nothing if C'Thun had survived. You are truly a champion of prophecy. Calen seen in Bastion of Twilight against Sinestra. Sinestra喊道： I tire of this. Do you see this clutch amidst which you stand? I have nurtured the spark within them, but that life-force is and always will be mine. Behold, power beyond your comprehension! Calen喊道： Heroes! You are not alone in this dark place! Calen喊道： Sintharia! Your master owes me a great debt... one that I intend to extract from his consort's hide! Calen喊道： You are weakening, Sintharia! Accept the inevitable! Sinestra喊道： You mistake this for weakness? Fool! Sinestra喊道： Enough! Drawing upon this source will set us back months. You should feel honored to be worthy of its expenditure. Now... die! Flame of life, burn within me and renew my vigor! Calen is voiced by Sam Riegel. 补丁 4.0.3a (2010-11-23): Seen in Twilight Highlands and later in Bastion of Twilight against Sinestra.